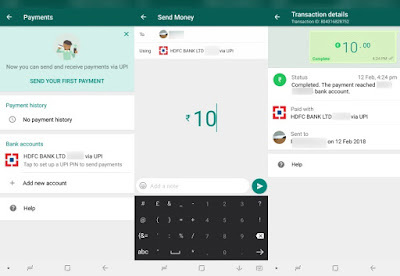 The new WhatsApp beta versions come with a payment option under the attachments option and is based on Universal Payment Interface (UPI), reports GizmoTimes. WhatsApp payments are now running on the iPhone, along with the selected Android smartphones in India, which can bring another digital payment option in the country. The new Whatsapp payment feature is very convenient, and due to the huge popularity of the app, there is potentially a big user base in the country. Apart from this, since it is based on the UPA, these funds will go straight to your bank account, eliminate the need of mobile pockets and other similar financial instruments are not sure how the VAT payment works. 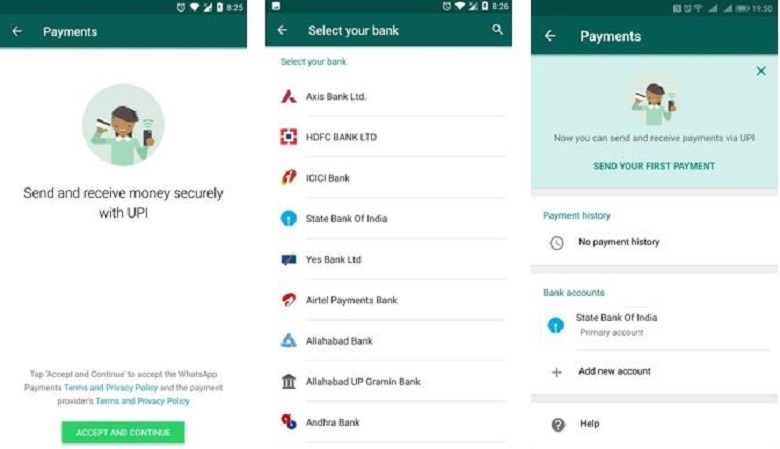 As we said earlier, the Whatsapp payment facility is currently available for the selected users in India. First of all, make sure that you are running the latest version of the app to enter this report, which is on v2.18.41 Android and iPhone v2.18.22 Open any Whatsapp chat and see if you are under Settings Looking for a new payment sub-head If you do, great, now you have access to WhatsAppSpace-based payment facility. If not, you do not have any other options. Payment facility will take advantage of the UPA (Unified Payments Interface) and it will include support from many banks including State Bank of India, ICICI Bank, HDFC Bank and Axis Bank. The UPA is a system through which Indian users can work in 30 banks of the country with the help of smartphones. Navigate to Settings >> Payments inside WhatsApp. In the Bank Accounts sub-head, click on the “Add New Account“. Now Accept and Continue if you agree to the terms & conditions. 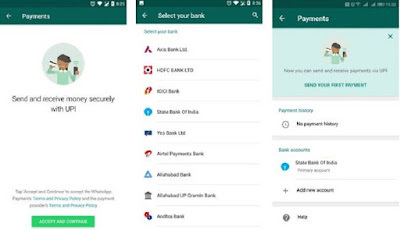 Once, your mobile number is verified by WhatsApp UPI platform, the list of bank accounts linked to that particular mobile number will automatically show up. select the bank whose account you want to add. 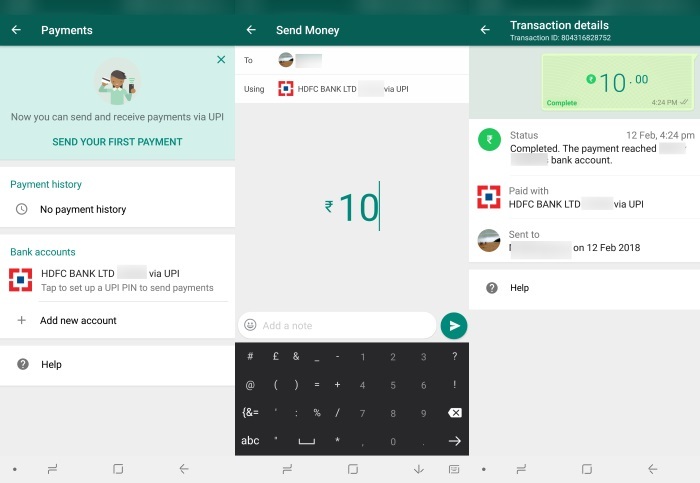 After setting up the UPI, you will need to enter the last six digits of your debit card number and the expiry date to create a Virtual Payee Address (VPA). If everything goes smoothly, UPI Setup Complete message will appear. To authorize the payment, just enter the UPI PIN of the bank account from which you are trying to send money. Once the money is sent, the amount (and the text note, if any) will show a message as part of the conversation. As you can see above, the process is quite simple and only takes a few taps to accomplish it. If you want to switch between accounts, you will need to tap the bank account while sending money and you will see a list of linked accounts in the middle. WhatsApp will maintain all log of all your transactions – the money you sent & received – using the Payments option under Settings. To check the log, just navigate to Settings, tap on Payments & select the View History option.